There are many different ways to arrange a funeral. We offer a wide range of services from traditional funerals to direct cremation. The funeral or memorial service can be held at our funeral home, at a church or religious building, or at a suitable location of your choice. We offer a wide selection of caskets and outer burial containers, a complete list of which is available at the funeral home. There is no legal requirement that a vault be purchased, however some cemeteries do require that a vault be used. A traditional service usually involves a viewing of the deceased in a casket prior to the actual funeral service. The viewing can take place the evening before the funeral or just prior to the funeral service or at both times. A viewing is not required, however, so you may choose an arrangement that does not include a viewing, such as a closed casket funeral or direct burial. Following the funeral service, friends and family usually drive to the cemetery in procession. The body is then interred in the cemetery or entombed in a mausoleum. The pallbearers place the casket above the grave and family and friends gather for a short service conducted at the graveside or in the mausoleum. A closed casket funeral can resemble a traditional funeral in every aspect with the exception that the body is not on display for a public viewing. Instead of a viewing, a period of visitation can be conducted where the family receives friends. By having a period of visitation, family and friends have an opportunity to come together to cope with the loss. Direct burial does not involve any sort of formal funeral service. After interment in a cemetery, a memorial service can be held to commemorate the life of the deceased. 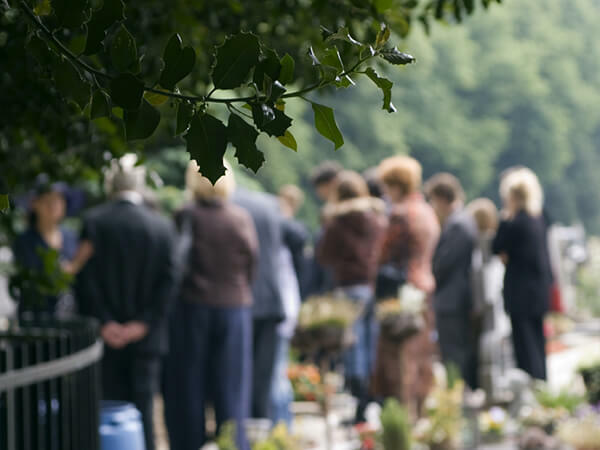 A graveside service can be conducted as part of a traditional funeral service as described above or by itself. This type of service alone does not involve any sort of formal service prior to the gathering of family and friends at the cemetery. A viewing can be held prior to the graveside service either at our funeral homes, a place of worship or a suitable location of your choice.